As a mother of five, my tree is decorated with many picture frame ornaments my children have made for me over the years. My 13-year-old daughter made this one for me. 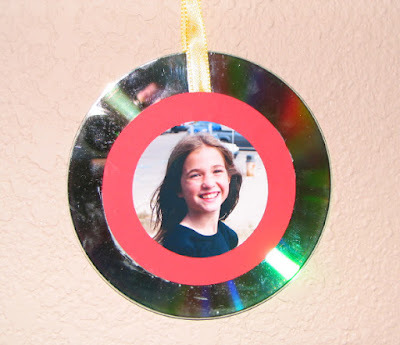 This particular one is special to me because she is the computer technical one in the house and she used a blank CD for a picture frame. Not only does it have her pretty face on it, but it reflects her creativity and favorite hobby. Thread ribbon through middle of CD, glue ribbon to CD, tie the ribbon at the top to form a loop for hanging. Glue 5-inch circle to the CD side with writing, let dry. Glue 3 1/2-inch circle to the middle of the other side, covering the hole, let dry. Finally, glue the picture to the middle of the 3 1/2-inch circle. Copyright © 2008 by Nancy Wallace. All rights reserved.